I grew up in Colorado. A great state for growing up in during the 50s and 60s before the right wing completely took over the state. 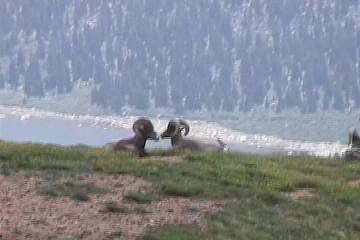 I took the picture of the mountain sheep on Pikes Peak. They were magnificent. I kind of liked that it was two males face to face. Boulder Colorado was my home from grade school all the way through graduation from the University of Colorado. The most important thing in my life is my partner, Ken Sherrill. We have been together for over 30 years. Ken is a professor of political science at Hunter College of the City University of New York. He is not only my partner but my moral center. I depend on him in so many ways. Below is a picture I took of him recently. We met in Central Park. Gee, that sounds romantic. Since he is a private and independant person, and this is my website, I'll leave most of the other details of our life together to your imagination . Having a life partner with the intellect and compassion of Ken is the luckiest thing that ever happened to me. Click on a picture and view the whole gallery.